Steve Sinnott is one of our Accredited Applicators in England, specializing in restoration of Victorian Geometric Encaustic Tiles. This particular project was completed in 2013. If you are interested in how he works, he has provided detailed notes on his projects which is downloadable at www.heritagetiling.com. 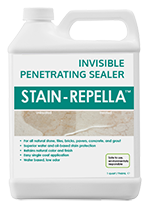 Deeper Penetration - Stain-Repella's sealing molecules are engineered to be much smaller than your average impregnating sealer for better penetration, even into dense materials, such as granite. Stronger Bond - Stain-Repella's smaller molecules wedge themselves better into small nooks and crevices (stronger mechanical bonds). The hydrophylic atoms, which enable the molecules to adhere to the treated surface, are better arrayed for superior adhesion. These 2 factors also give Stain-Repella™ a longer lifespan than common penetrating sealers. Superior Stain Protection - Stain-Repella's deeper protective barrier stops water traveling right up to the surface where it might cause visible damage. Stain-Repella's liquid repelling atoms are also arrayed for maximum repellence, providing superior stain protection. For more information and to find a stockist/applicator, please click here. We have compiled a series of specialized guides to make it easier for you to specify your next project. 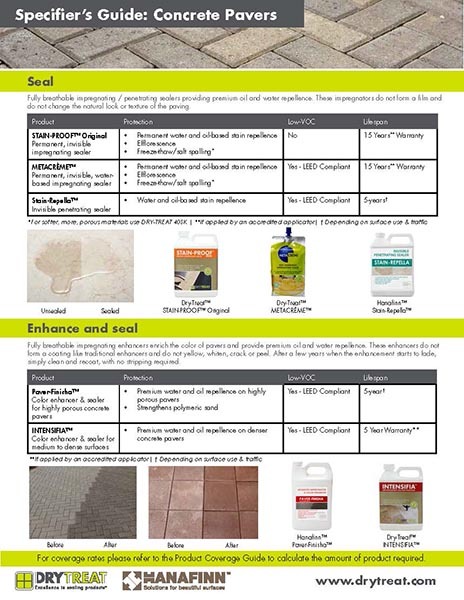 These are available on our page www.drytreat.com/specifier-guides.html as downloadable PDFs.